In 1986 Andrzej Sapkowsky wrote "Wiedźmin" ("The Witcher") and with it he created what became a favourite to many Universe. In 2007 CD Projekt adopted this Universe and created the first PC Witcher game. In 2014 CD Projekt together with Fantasy Flight released something that probably a lot of people wanted - a board game based on The Witcher. In the game you take the role of one beloved character and roam the lands completing quests and defeating monsters. The game is for 2 to 4 players and designed by Ignacy Trzewiczek. NOTE: I'll tell you about the digital port of the board game, because I have not played the hard copy yet. Also because of this there will not be a comment on components quality. Here unlike the PC Games you will be able to choose between few characters like Geralt, Triss Merigold the sorceress, Dandelion the bard and Yarpen Zigrin the dwarven warrior. Every character has special abilities and is better at something then the others. The quests for each of those characters are centred on their abilities. For example Geralt is the best fighter and he will handle monsters easily, Dandelion is best at collecting gold and Yarpen is decent warrior and able to collect gold better than Triss and Geralt, but also probably the best at getting clues thanks to his band of dwarves. After you choose your characters, players will have to decide on how many Main Quests will be completed before the end of the game. When this is done each player will have to choose his first Main and Side quests. Usually the Side and the Main quests are thematically connected, but there is no real story telling while gathering leads and getting closer to your goal. To complete a quest you will need to gather a certain amount of Proofs and get to a certain location. Completing Side and Main Quests give you VP and at the end of the game the player with most VP wins the game. To collect Proofs you will have to roam around the cities bearing in mind that different cities give you one of the three kinds of leads - red, blue or purple. When you collect certain amount of leads they transform into Proofs. The amount of leads you will need depends on your character. For example Geralt will turn red leads into Proofs quicker than blue ones and Dandelion will turn purple into Proof quicker than red. Other way to collect leads is to resolve different kinds of cards like Investigation and Good Fortune cards. Every Main Quest have consequences and they are resolved immediately after completing the quest. If the game is played for more than one Main Quest( 3(5) maximum which caps the game at around two hours.) then the player who completed his Main Quest is given again two Quest cards to choose his next Quests. Now the world of The Witcher is dangerous one so I hope you didn't expected that you will just take a walk around, do some side seeing and win the game. No, this won't happen. At the end of each of his turns, every player will resolve obstacles in the area. Those can be two kinds - Monster Encounters and Foul Fates. Both of those can be located in the same area, but when resolving obstacles the player can choose which of the two he wants to encounter. Monsters can be three kinds - bronze, silver and gold. The bronze are the easiest and characters suffer less if defeated and the gold ones are the strongest with heaviest consequences. When the obstacle is a Monster a battle starts. Every Monster has sword and shield value which is their defence and attack values. The player who is fighting the monster will roll the battle dice and his hero die trying to match or exceed the defence value of the monster by rolling swords and defeat it or if not at least match or exceed its attack value by rolling shields and therefore defend against it. Bur bear in mind that when you start fighting against silver and gold monsters there will be some that will require to both defeat them AND defend against their attack if you want to not suffer any negative effects from the encounter. The negative effects include wounds that prevent you from using actions, loosing gold, victory points or placing Foul Fate tokens on your actions. Big help in battles will be the Development cards which you can acquire by using the Develop action on your turn. Some Development cards need to be charged before used and that is done by Brewing (if you play Geralt), by Preparing (Triss) or with the help of your dwarves (Yarpen). Most Development cards will allow you to manipulate the dice rolls which will proof really helpful for you so don't overlook them. Foul Fates on other hand are a lot more straightforward. When you're resolving Foul Fate as an Obstacle at the end of your turn you will draw a Foul Fate card and resolve it after which discard it unless it is not stated otherwise. Some effects will force you to put Foul Fate tokens on some of your actions and if you perform those actions you will also draw Foul Fate cards and resolve them. 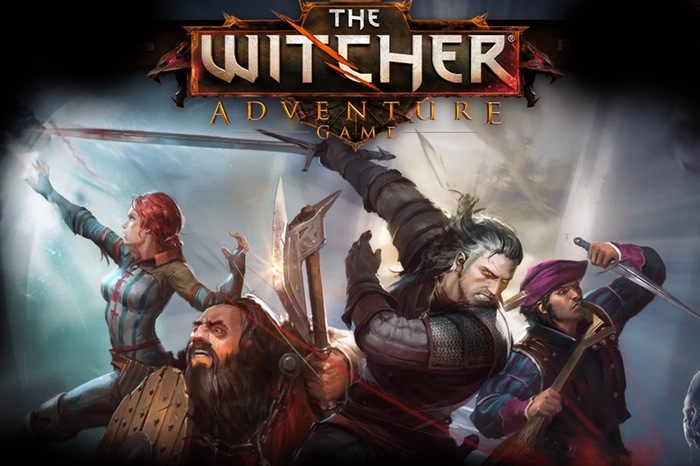 Now as I said this review is relevant only to the digital port of the Witcher The Adventure game, so I decided also to talk about some things that are relevant only for the port. First of those things is the AI and while it is nice that it is there the AI is rather incompetent and after few games against it you will feel like playing alone. Second thing are the battles. When you fight versus the monsters you see just the card of you enemy and when you click dice are rolled and then resolved and while this is enough if you play a real life board game it really feels wasted that the game is ported to digital if they have not used the opportunity to turn the battles and the game itself into something more spectacular (see Armello for example). But on other hand this turn the digital version into faithful copy of a board game which is ok I guess. The only real benefit of the digital port is the music which is really thematic and well composed. I'm big fan of the Witcher and I was really excited when I heard that there will be a board game and maybe that's why I was disappointed when I played it. Witcher The Adventure Game is a mid-level board game for people who are looking for something more than a party or a filler game, but that is not the problem. The problem is that the game feels like a re-skinned and re-themed Talisman with few things added and changed here and there. You just roam the map, do quests, fight some monsters and gather points, rarely interacting with the other players, because you don't really have to. To you they're nothing more than few more strangers that you may meet in the cities, which is strange considering that in the story all four of them are friends and know each other well. For a themed game the theme is light and weak. Truly the characters are from the Witcher Universe together with the names of the cities and monsters, but Witcher is this dark, beautiful world of magic, monsters and intrigues and none of those is really well represented in this board game. The game could have been called The Knight and with few visual corrections here and there give absolutely the same feeling when played. I don't recommend it to any fans of The Witcher, but still if you want to try it bellow you will find some places where you can find it. Публикувано от Sharki в 9:55 ч.